I have ever abhorred, since the first dawn of my understanding to this its obscure twilight, all the operations of opinion, fancy, inclination, and will, in the affairs of government, where only a sovereign reason…should dictate. Government is made for the very purpose of opposing that reason to will and to caprice, in the reformers or in the reformed, in the governors or in the governed, in kings, in senates, or in people. There is perhaps no word in contemporary American discourse which carries a more unambiguously positive connotation than the word “democracy,” no word so common in the mouths of politicians, and other disreputable types, hoping to burnish their appearance in the eyes of the public. With us, to ascribe to the unqualified goodness of democratic governance is simply to hold sane and tolerable political views; to doubt that goodness is to dwell somewhere among the ideological precincts of fascism. Moreover, when we justify our faith in democracy to ourselves, we always say that democracy is the best form of government because it best embodies the “will of the people,” a phrase and an idea we have all been taught to reverence from our youth. Nothing could be more bracing then to a modern American than to open a volume of Burke, and encounter there an evidently wise and humane thinker referring to these things with such consistent disdain. The word that fills us with pride fills him with horror. The motto which we take as the seal of legitimate government he takes as the byword of arbitrary power. We are cast at once into an entirely new connotative atmosphere, such that we are forced to call into question the self-evident truthfulness of the political mantras chanted at us on a daily basis. I am confident that this experience will occur over and over again to any modern American reading Burke with a willingness to wrestle earnestly with his thought. It is not just that Burke presents one devastating argument after another against the most sacred truisms of American political discourse, though he certainly does this. What is finally most impressive about Burke’s work is that novel connotative atmosphere he creates, the startlingly strange but persuasive aura of thought which permeates his writings from the beginning of his career until the end. Take, for instance, the question of rights. In contemporary discourse, an appeal to rights always constitutes an attempt to disarm argument. The minute someone asserts his right — to education, to healthcare, to what have you — half of our skepticism towards his position is dissolved, because we are all convinced now that the highest duty of a government is to preserve the “natural” rights of men in a civil order. An appeal to rights, therefore, always serves to put the community on the defensive. Contrast this with the prevalent tendency of Burke. His repeated references to the “rights of men” are invariably contemptuous; one senses he can hardly get the phrase down on paper without spitting, such as when he writes “if the rude inroad of Gallic tumult, with its sophistical rights of man, to falsify the account, and its sword as a makeweight to throw into the scale shall be introduced into our city by a misguided populace…we shall all of us perish and be overwhelmed by a common ruin.” This is not to say that he finds no legitimate use for the concept of a political right, but then it must really be a political right, that is to say, a right emanating from a man’s station in a certain community, and from the traditions and conventions of that community: “Far am I from denying in theory, full as far is my heart from withholding in practice…the real rights of men. In denying their false claims of right, I do not mean to injure those which are real, and are such as their pretended rights would totally destroy.” What he calls the “pretended rights” of the Revolutionists are always the rights of the “natural,” pre-social individual, asserted against the community. They represent an attempt to secure the perfect freedom of uncivil man within the civil order, a necessarily futile project, since “men cannot enjoy a civil and an uncivil state together.” An assertion of these rights is always an imposition of individualist volition against the limiting and guiding structures of the community. Thus, the term “rights” generally carries in Burke’s work a cloud of suspicion with it; it is always prone to abuse as a fraud. It is always more likely to be an assertion of will, rather than a deduction of reason. It is the assertor of a right, therefore, who must always be on the defensive. Whereas with us, an appeal to rights always dissolves skepticism, with Burke, it always arouses skepticism. Whereas with us, an appeal to rights ends debate, with Burke, it invites it. It is hardly going too far to say that in the writing of Burke, one encounters a new political language, for even where his terminology is the same as our own, the significance and effect of that terminology is not what it is for us. This has obviously been one of the main causes of his unpopularity for Americans. But it is also the secret to the immense potential for change contained in his corpus. Because what Burke forces us to do, if we really take him seriously, is to stand outside the invidious atmosphere of liberalism which permeates and stifles every last recess of modern society, to recognize it — for perhaps the first time in our lives — as only one form of political order, and that not the most just or appealing, and thus to rob it of any claim to self-evident truthfulness. For at the level of practical politics, liberalism is just a certain kind of language, with its own connotative atmosphere — an atmosphere in which appeals to rights cow everyone into a cessation of debate, where appeals to freedom are generally hysterical and unqualified, where doubts about the virtue of “the people” are always akin to wickedness. To stand outside that atmosphere for the first time is to realize that there is nothing obvious about these assumptions, that, to the contrary, there is great reason to question the rightness of the whole world view implicit in this language. And the moment we entertain such doubts, liberal dogma loses the greater part of its persuasive force, because liberalism has always presented itself as a universal creed, as the commonsensical conclusions which all honest persons will arrive at in time, divested of the superstitions and prejudices of their own local traditions. Once this pretense is stripped away, once liberalism appears to us in its true light, a single perspective among many equally plausible rivals, it loses the privileged ambience which is its hidden power. No other author strips away that pretense so relentlessly and thoroughly as Burke; no other author has the power to make us see the liberal language surrounding us as something wholly contingent and supremely dubious, and thus to inspire us with the confidence to confront it unfalteringly. In this respect, Burke closely resembles one of his more famous polemical opponents, Joseph Priestly, the Dissenting minister and the discoverer of oxygen — both of them revealed to us the air we breathe. As I noted in my last essay, James Banks accuses the authors here at FPR of generally “idealizing” community, or otherwise treating community in an “abstract” fashion. This charge, in fact, is wildly inaccurate, as anyone who has spent time reading the material at this website can confirm. In general, the authors here have tended to put much stock in specific communities — typically, their own — all across this country, appealing to the local customs and culture of their places as a source of political renewal. And it is precisely on this point that I find myself dissenting most consistently from the work published here, because I think, in most cases, the authors fail to account for how deeply the language of liberalism has permeated every nook and cranny of American life, how far down it has seeped into even the most apparently conservative communities, and thus they have tended to overrate the resources for political renewal present in any American community, as it is currently constituted. Whether in blue states or in red, in the city or on the farms, Americans all speak the same language now — they all speak liberalism. It is spoken as much in our local elementary schools as in the corridors of academia, in the town hall meeting as commonly as the Senate-floor debate. Travel where you please across this country — if you speak there of the potentially malignant effects of majoritarian rule, of the absurdity of “natural rights,” of a liberty qualified by intrinsic human nature, you will be speaking a foreign political language. It would seem to me that a viable conservative politics must start from an acknowledgment of this unpleasant reality, a frank admission that in America, those who do not subscribe to the dominant liberal ideology — and particularly, to the rancid and dehumanizing conception of liberty at the heart of that ideology — are effectively strangers in their native land. Our challenge then, at the most basic level, is simply to avoid speaking the language of liberalism, to prevent it from influencing our personalities and forms of life as effectively as we can, and this demands that we maintain some form of aloofness from those communities in which that language is the prevailing idiom. The forms which that aloofness might take are almost infinitely various, and I have no desire at this point to state my preferences for or against any. I simply wish to dispute what I take to be the profoundly mistaken confidence that full and authentic participation in American civic life can proceed from anything other than general loyalty to that whole liberal vision of things which Burke so effectively punctured. Those who perceive the deep truthfulness in Burke can never feel perfectly at home in modern American society. But of course, the condition of an exile is not tolerable for long, and the real work of conservatism at the present time is to prepare the conditions requisite for the establishment of communities which will serve as an alternative to the dominant liberal society. To say this is not to commit oneself to utopian speculation, or abstract theorizing; it is simply to acknowledge the prime place which the faculty of imagination must take in our work at the present time. We greatly misunderstand that faculty if we consider it merely as a vehicle of reverie or escapism. Properly understood, and properly exercised, the imagination is the means by which we perceive unrealized possibilities among our present circumstances. It is the vision which sees the telos, or perfected form, in ourselves, in our artwork, and in our communities, and sets that up as the goal of our laboring. The imagination is the bridge between potential and actuality in all human affairs, for the former will never be transformed into the latter until it is grasped by the mind. The failure of modern conservatism has been fundamentally a failure of imagination, a failure to imagine new possibilities for our society, and a consequent resignation to deliberating among the political options already available, which are all liberal options. The one authentic conservative movement I have seen in my times has been the homeschooling movement, and it is remarkable how little it has had to do with mainstream debates over vouchers and charter schools and standardized testing and union influence and teacher accountability. The leaders of this movement have simply ignored the barren choices represented by these debates, and imagined an entirely different mode of schooling for their children; the result has been the broad implementation of a curriculum, based on classical sources, which generally dwarfs the level of instruction on offer in our schools, public and private. This is what I mean by seeing new possibilities, and this is proof that to imagine a different direction for our society does not mean to float off into realms of airy or dangerous idealisms, but rather, to identify the causeways leading out of our engulfing decadence. How then should we begin imagining new possibilities for our society as a whole? If liberalism is, as I have claimed, its own kind of language, then it follows that one of the most efficacious ways to move beyond its dominance would be the cultivation of an entirely different language, one with its own connotative atmosphere and its own forms of final appeal. And it is this task which most requires the assistance of Burke. In my next and final essay, I will explain why I believe a close study and emulation of Burke’s rhetoric affords us the one viable intellectual route out of our political darkness. This essay is the second of a three-part series. Read Part I of “A Burke for Our Times” here, and find more essays by Mark A. Signorelli at markanthonysignorelli.com. Thank you. Two for two knocked out of the park. Very much looking forward to the final installment. But instead of creating or cultivating an entirely new language, could we instead return to a historical/religious social narrative that has at its core its own language? The one authentic conservative movement I have seen in my times has been the homeschooling movement… I’d like to expand on that point, if I may, from personal experience. My wife and I homeschool our daughter, and though most of our friends who homeschool would describe themselves as liberal and few of them use a classical curriculum, even in our group homeschooling is a conservative act, in that it promotes and embraces shared responsibility. It’s an embrace of the obligations (and joys) of family, of course. But it’s also taught kids and parents alike the value of community, and the group has coalesced into at least a sort of proto-community. The kids play together every week, from toddlers to young teenagers, of course they play and fight like any other bunch of kids. But they almost never are they in groups segregated strictly by age, which means that whatever issues they have at eight or twelve or sixteen are not given gravity by a peer group but are instead given quiet context by the presence of older and younger children: they look up to the older and nurture the younger. As a result (and with parents’ guidance) there simply aren’t the sort of cliques, bullying, or me-first attitude one would expect from kids in schools; they do a wonderful job working out their differences on their own, when they arise, without so much adult intervention. The parents, meanwhile, look out for one another’s children and — recognizing that we are in this together — for one another, when someone has a baby or is sick or loses a job or has a struggling business, and that’s the model of human interaction the kids are learning to see as normal. Homeschooling is usually portrayed as a flight from something, an individual decision (defended necessarily by recourse to rights) to protect one’s children from “society” or their peers, but the homeschooling I’ve seen has produced children far less likely to see themselves as autonomous individuals, each the center of his or her own universe: freed from the constraints of institutions, it’s an opportunity to lay the foundations of community. I have some knowledge of the intentional communities movement, a longstanding feature of American society that gets revived whenever large numbers are dissatisfied. Its most recent revival, in the 1960s, never really ended; the mainstream media simply fell silent on the subject. It is a truism of the movement that, of the communites founded in that most recent revival, the diverse, anarchic ones based on the atomistic classical liberal idea of individual personal freedom did not last. The ones that have lasted were founded on a pre-existing tradition, usually religious, with a leadership that has remained true to the values of that tradition. It doesn’t seem to matter whether the tradition was freshly imported from Asia or arose from a religious culture already established in this country. Even the ones I’ve seen that are officially secular, if they are of long standing, are based on the values and mores handed down from a religious tradition such as the Unitarian Universalist, the Quaker or, in one case, Ashkenazi Judaism. 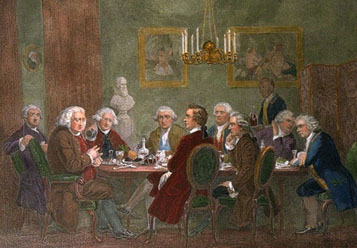 Burkean conservatives who intend to involve themselves in “the establishment of communities which will serve as an alternative to the dominant liberal society” could do worse than to peruse http://www.ic.org/, the website of the Federation for Intentional Community, especially the online bookstore and the searchable directory, which has “Christian” as one of the major categories. In response to the comments by David Walbert , I harken to my own childhood experience of having attended a one room country school. Eight grades, approximately 24 – 28 children of assorted age, true parental involvement and and excellent primary education. We moved to another part of the state following my having completed sixth grade. I then sat an ‘twiddled my thumbs’ for two grades while my classmates caught up to the levels I had already experienced. I have often wondered if our so-called public education system should not re-structure the classroom on that model for the very reasons that you describer as being the advantages of the home chool model. Being a fan of “liberty – equality – fraternity” and even of “from each according to his abilities, to each according to his needs,” I have always had a great deal of disdain for Burke. Besides, he opposed the American Revolution, and I have ancestors who fought in that war. Burke is of course correct that government should be an exercise of reason, not of will. In the modern context, reason dictates that an equitable means to provide everyone access to affordable medical coverage should be constructed. Reason also dictates that the cost of all medical care delivered must be paid for, and we must be honest about who is going to pay how much, through what agency. The weakness of Burke’s disdain for democracy is that neither monarchy nor any form of aristocracy is any more founded upon reason than popular sovereignty. We have never devised a means for identifying and installing as rulers a reliable set of philosopher kings — and Plato came up with some wierd perversions in the process of even thinking about what such rule might look like. Constitutional government has provided a reasonable semblance of popular will channeled through a governmental process that preserves some possibility for reason to assert its voice, although not always to prevail. David Walbert offers the most original and authentic hope that we could improve on where constitutional government has brought us to date. Since the home schooling movement, as it currently exists, is unlikely to become the primary mode of childhood education for all the people of the United States, we should look at how the forms and methods he describes might be incorporated into the public schools. This would require examining when, how, and why, communities become, often imperceptibly, institutions. Then, how do we put community back into an institutional context. Your reading of Burke is a tad daft. But I would expect such from a communist teaser. He was, in fact, a friend of the colonists. The very idea of a Philosopher King is revolting.We have those now, in unctuous abundance. Yes, Burke advocated that the grievances of the colonists were legitimate, but he affirmed that their rebellion was not. He presents to history that sad spectacle, the carefully reasoned friend of the people who prefers order to liberty when the chips are down. Then he was a tad too quick to condemn the French Revolution, root and branch. (I say this as someone who felt properly conflicted reading A Tale of Two Cities, as Dickens no doubt intended). I freely admit, that a carefully reasoned revolution would be my own preference, but that doesn’t induce me to adhere to monarchy. Clarence Darrow had intellectual luxuries not available to Burke. No argument on the Philosopher King. While I think there is something to calls for more emphasis on the classics in education, Plato has always been a good reason to think that the classics can be over-rated.